Overview - The story of the battle of Iwo Jima between the United States and Imperial Japan during World War II, as told from the perspective of the Japanese who fought it. By all accounts, 'Letters from Iwo Jima' was supposed to be a side project -- a companion piece helmed by Clint Eastwood to compliment the backstory of his 'Flags of Our Fathers.' But once audiences were exposed to it, the film quickly became more, earning stronger critical notices than 'Flags,' and even earning a pair of Oscar nominations for Best Picture and Best Director. The story focuses on a small group of Japanese soldiers who tried desperately to hold the island of Iwo Jima from the advancing American army. 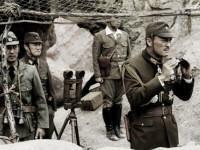 General Tadamichi Kuribayashi (Ken Watanabe) is assigned the impossible task of repelling an unrelenting military force with only a handful of men. At the bottom of the ranks, a young soldier named Saigo (Kazunari Ninomiya) watches inner-conflict tear away at the general and his officers as they prepare for the coming battle. By focusing on the psychological effects caused by another nation's war machine, 'Letters from Iwo Jima' isn't what we've come to expect from a war film. It doesn't examine heroism or military brotherhood, but rather, how a group of soldiers suffer the knowledge that they will never see their families again. As such, it stands out as a quiet but powerful reminder that humanity perseveres even in the face of insurmountable obstacles. While 'Flags of Our Fathers' received a mildly mixed reception (earning a 73% "fresh" Rotten Tomatoes rating), 'Letters from Iwo Jima' earned almost consistent praise from critics (as evidenced by its 91% "fresh" RT rating). For my own part, I reached the end of the film with only one complaint -- I wished it was even longer (the runtime is already a healthy 2 hours and 21 minutes). Not only is the acting superb, the script is both heartbreaking and inspiring at the same time. 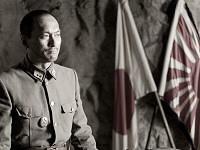 Watanabe is at his best, turning in a quiet and reflective performance that exudes honor and respectability. He even sells his character's distaste for the war itself while making it clear how much honor and loyalty meant to a Japanese soldier in World War II. Likewise, Ninomiya is a young revelation and evolves the soft naivety of a boy into the hardened outlook of a wise man. 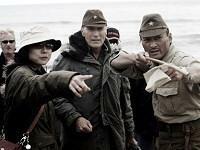 His scenes with Watanabe are handled with finesse and Eastwood's direction is impressive throughout. The cinematography is gorgeous as well, with the sepia palette lending a somber tone to the film and bringing a sense of sadness to each shot. At times, the graphic and realistic depictions of war make 'Letters from Iwo Jima' difficult to watch; but its moments of human interconnection pull the film together. As the credits rolled, I found myself sitting in silence -- amazed by the film's bravery to tell an emotional story about the opposing side in an American conflict. As with 'Flags of Our Fathers,' some have interpreted 'Letters from Iwo Jima' as a film with a "hidden message" intended to draw parallels with the current war in Iraq. But once again (to my eyes), Eastwood's film lacks any specific political agenda aside from its portrayal of the determination to do battle, even at the brink of certain defeat. The film's timelessness lies in its examination of a soldier's willingness to fight under the guise of doing the greater good of their nation. 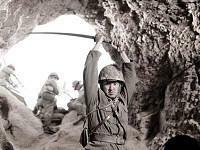 In short, 'Letters from Iwo Jima' is an exceptional film that offers a unique perspective rarely seen in American cinema. It's certainly worth an evening of your time, especially as a complimentary piece to 'Flags of Our Fathers.' It's not only a fascinating war film, it's a sobering character study that shows a group of men at their best in a time of great conflict. While they come from two different studios ('Flags' is distributed by Paramount, while 'Iwo Jima' is a Warner title), both Eastwood epics share a similarly exceptional picture quality on high-def. 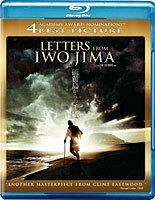 Presented in 1080p using the VC-1 codec, 'Letters from Iwo Jima' is simply stunning. Like the high-def releases of 'Flags of Our Fathers,' this transfer is overflowing with crisp edges, deep black levels, and great shadow delineation. The color palette is muted, but beautiful in its own right. Contrast is also nice, making the film feel more like a documentary than a modern war film. Likewise, the skintones are purposefully drained of color and the realistic shadowing adds a convincing amount of depth to the picture. But perhaps best of all, 'Letters from Iwo Jima' boasts reference level fine object detail. Dust settles on war-weary arms, bullets splinter on stone, and explosions send tiny flecks of debris through the air -- it's truly a feast for the eyes. The source is pristine and there isn't any noise, crushing, or artifacting even when bright, swirling smoke veils a shot. The only problems with the visual presentation are minor. First, I caught four instances of faint color banding -- the most noticeable of which occurs early in the film when Watanabe gazes out across at the gray sky (I should point out was staring at the light skies specifically to see if the problem would pop up -- most people won't even catch the banding at all, and it certainly didn't detract from the extremely impressive video presentation). Second, like the video presentation on 'Flags of Our Fathers,' some of the seams of the special effects are exposed by the high-def presentation. Again, this isn't the fault of the transfer per se, and with time I'm sure that the effects houses will catch up with the heightened scrutiny that comes with high definition. Dialogue is clear and stable, well prioritized in the soundscape, and easy to understand -- even in the heat of battle. The smallest details in the sound design are present and there is a nice realism to it, especially in moments of pure chaos. Impacts and explosions have weight, voices sound weak by comparison, and all of the sounds function as they should in the soundfield. Channel movement and accuracy are both handled with care and the subtlety by which effects pan across the speakers really allows for complete immersion in the film. Ambient noise (particularly in the underground trenches and tunnels) nestles in amongst more prevalent elements in the mix and brings the island to life in your home theater. As picky as I tend to be, I can't find anything in the audio presentation for 'Letters of Iwo Jima' to complain about. While all of the included special features can also be found on the standard-def DVD edition, most of the supplements on this Blu-ray release get the high-def upgrade. First up is a balanced behind-the-scenes featurette titled "Red Sun, Black Sand: The Making of Letters from Iwo Jima" (21 minutes). Clint Eastwood plays pseudo-host and takes his time describing the reasons for this companion piece to 'Flags of Our Fathers.' I could feel the respect for the combatants at every turn, especially as he explained his reasoning for telling both sides of the story. This featurette also includes interviews with cast and crew, on-location footage, and a fairly detailed look at the research and attention to detail that went into the production. It's clear from watching this all-too-quick peice that Eastwood and those involved were more concerned with honoring the dead, rather than making a spectacle. I also found it captivating to watch a group of people make a "secondary" film without any notion that it could eclipse its older brother. Next is a truly exceptional featurette called "The Faces of Combat: The Cast of Letters from Iwo Jima" (19 minutes), which includes interviews with the cast as they describe each of their character's motivations, characteristics, and the unique characteristics they brought to their roles. Watanabe is so thoughtful and studied in approach to his role that it made me want to turn around and watch the film all over again with his comments in mind. Wrapping up the supplemental package are: a photo montage set to the film's score (4 minutes); a standard-def featurette covering the world premiere of the movie in Tokyo (16 minutes); and another standard-def featurette that contains a press conference (19 minutes) in Japan with Eastwood, Watanabe, and others. For the most part, each of these lesser features are promotional in nature, and best left to fans who dig through every corner of every disc. There are a few good pieces of information during the press conference, but the language barrier seems to keep it free of any deeper exploration of the film's creation. The only other feature on the disc is a standard definition version of the film's theatrical trailer. Strange that it's not in high-def, but it's included nonetheless. The Blu-ray release of 'Letters from Iwo Jima' is an experience and everyone should give this "other story" of the Battle of Iwo Jima a shot, whether you enjoyed 'Flags of Our Fathers' or not. Fans will be excited to see that both the video and audio quality set a high definition benchmark for future releases of this sort. And while I personally would have loved to have listened to a director's commentary for this one, a somewhat slim set of supplements is the only small dent in this otherwise impressive package that's well worth your high-def dollar.